Natio is one of the fastest growing beauty brands in Australian department stores and the top performing skincare and bridge make-up brand in Australian pharmacies. So, what makes Natio unique? Why is it different to other skin care and cosmetic houses? 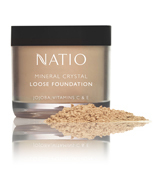 Are you looiking for Natio Skin Care products? Visit our Natio Skin Care Range.